Want a fresh start to 2015? Join me for "Countdown to Clean" during December, where we'll trade bad practices for good ones to start the New Year with promise. 2015 can be the best year ever, and this process will provide specific easy steps to make small decisions that yield big outcomes. Happiness is the goal, and I will share simple tips that guide your everyday choices to get it. Out with the faux, in with the ooh! Trade highly processed food packed with chemicals for stuff your body is built to handle. Learn simple substitutions for the caustic formulas that kill germs and the environment and stink up your place. Indulge in lotions, potions and more that create a healthful glow you feel and others see. Discover easy ways to feel great by being a positive influence. All you have to do is read. There's no program, no sign-up, no fee, no nothing -- just read the posts here. Think about it or act on it. It's up to you.Please join me, and share your experience as we go. Let's look forward to going Out with the faux, in with the ooh! in 2015. 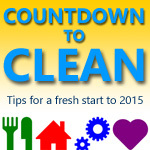 Posted in Countdown to Clean for 2015 and tagged clean body, clean conscience, clean eating, clean food, clean home.